Real estate brokers and salespeople in Ontario have to-date not been able to incorporate their business and so they operate as a sole proprietor within the industry and brokerage framework when registered by the Real Estate Council of Ontario (RECO) as brokers and salespeople. This aspect of the real estate business is evolving and there are options that allow a broker to incorporate and become the “Broker of Record” of their own brokerage business. Many brokers look towards the national brokerage* franchise model as the path to successfully growing their business and taking advantage of the benefits that incorporation offers (tax savings, income deferral, building business equity, etc.) as well as the national brokerage company’s reputation, services and experience. Franchise fees of $10,000, $25,000 or more are commonplace depending on franchisor, territory, etc. Other brokers find that establishing their own real estate business through an IBO allows them significant freedom of operation (no territory restrictions and unlimited growth potential) with the added benefits of incorporation. A new model of brokerage is emerging after being vetted by RECO and operating within the Real Estate and Business Brokers Act 2002 (REBBA 2002) legislation that is called a “sub-brokerage*” (or mini-brokerage or sub-franchise) but defined by RECO as a separate brokerage having the same rights, requirements and obligations as any other brokerage. Sub-brokerages operate as a brokerage franchise under the local brokerage* masthead sharing office space and services while maintaining a certain level of independence afforded through incorporation and the sub-franchisee agreement. 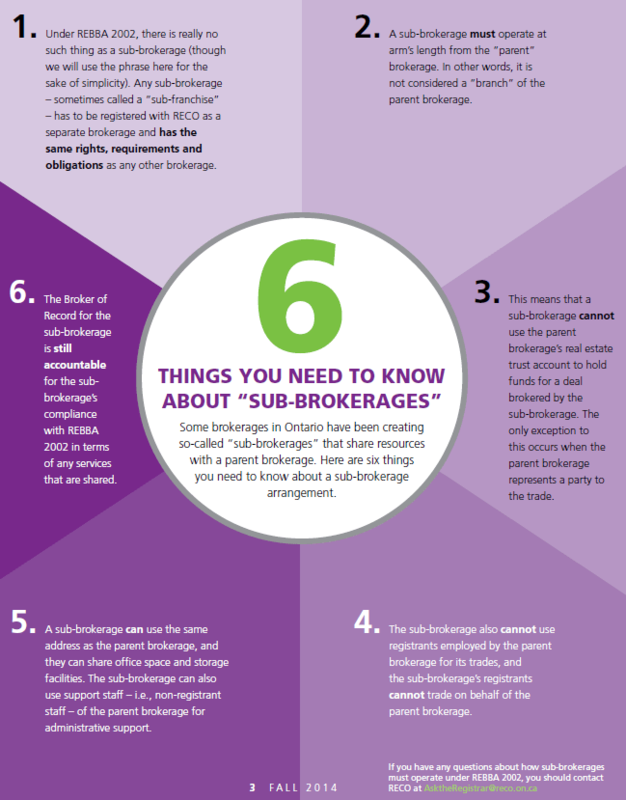 The operating limitations imposed upon the sub-brokerage owner can vary greatly according to the national brokerage franchise terms and the additional limits imposed by the local name brokerage agreement. The Realty Point Brokerage franchise model has turned this sub-brokerage model into something quite a bit closer to the IBO model through a series of carefully crafted operating conditions approved by RECO. The traditional naming convention of a real estate brokerage franchise has been turned around. A franchisee puts their name first in the naming convention of their brokerage so you have “Your Name Realty Point Brokerage” allowing a greater opportunity for brand building and recognition. Shared office space and administration services allowing for franchisees of Realty Point Brokerage to lower their costs of office space and administration staff while maintaining the level of professionalism and service excellence that their clients rely on. No territory limitations are imposed by Realty Point Brokerage allowing for a broker to establish and grow their business in the area they prefer. Realty Point Brokerage offices are currently located in Toronto, Markham and Oshawa, Ontario. The lower cost of $5,000 for a five year franchise agreement with straight-forward ongoing costs of $500 per month for private office space and $500 per transaction for closes. The franchise cost includes your brokerage set-up and guidance throughout the incorporation process and RECO brokerage registration, and brokerage training and guidance to help you successfully build your business. Included in the monthly office costs are phone and fax services on private numbers/lines (including answering services and call forwarding), reception services, access to shared computer rooms, board rooms and seminar room), printer and copier equipment, internet access and document storage. Additional services are available on an “as needed” a la carte basis. Transaction fees include the services of the deal secretary, transaction co-ordination, ongoing administrative support, trade record sheets and transaction reports, broker listings, uploads and distance trading availability (work anywhere services). The Realty Point Brokerage franchise agreement covers such issues as the privacy of each brokerage, non-compete regulations concerning the recruitment of brokers and sales staff and confidentiality of their contacts, leads and deals. The central focus of the Realty Point Brokerage model allowing a franchisee to take advantage of technology, territory and shared resources to lower costs and build equity in their business is a disruption of the traditional brokerage model that is being well received by real estate professionals searching for the right option that allows them the freedom to build a business without the financial risks associated with IBO’s or the high cost of national franchise operations. Contact us today for your confidential free consultation.